Unexplained water meter readings? Try leak detection! If you’re consistently taking unexplained water meter readings, then you could have a leak in your piping which is causing extra water to be used/wasted. An easy way to find this out is to take note of your previous month’s water usage and compare this with your current month if it seems particularly high. These high meter readings could cause unwelcome extra costs, and if left for long period of time could add up to hundreds of pounds. It’s therefore essential that a leak is found and fixed quickly. 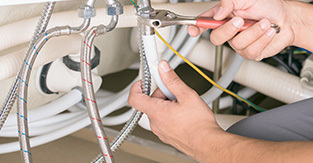 Here at Cheshire Plumbers we specialise in pipe leak detection and have a wide range of techniques to find your leak wherever it’s located. We often look for leaks in areas which would usually be inaccessible due to being covered in tiles, concrete, wooden or laminate flooring. With traditional methods these would have to be pulled up which could be extremely costly or disruptive, instead we have equipment which can find it quickly. Through methods such as thermal detection we can quickly find the leak to within a square meter, which we can then find a solution for. Our pipe leak detection specialists are all trained to the highest level to ensure that you receive an exceptional standard of workmanship. They’re trained in all areas of plumbing and so can not only source the problem, but solve it. It’s easy to ignore unexplained water meter readings, but don’t end up paying more than you need to! Instead get in touch with a member of our team here at Cheshire Plumbers, and use pipe leak detection to find a fast and efficient solution. Simply contact us and we can provide you with advice and a no obligation quote.